Apple on Wednesday local Japan time activated a two month-long Apple Pay promotion offering cash back, points and more to users of the digital payments service, just in time to take advantage of six new supporting card issuers. As noted by Japanese blog Ata Distance, Apple posted a dedicated webpage for its "New Life" campaign earlier today. With the promotion in place, customers using a variety of company-issued credit cards between March 1 and April 30 can reap benefits like cash back on purchases and special store rewards. For example, JR East, one of Apple Pay's first Japanese partners, is offering users a 1,000-yen credit with a renewed commuter ticket or new ticket purchase made through the company's Suica app. Brick-and-mortar convenience stores are also participating, with Mini Stop offering 50 yen off soft serve ice cream, and Sukiya knocking 70 yen off all main menu items, when customers pay with Apple Pay. Drug store Matsumoto Kiyoshi is set to offer in-store rewards from April 1. Apps and online services taking part in the Apple Pay campaign include Japan Taxi, Toho Cinemas, Demae-Can, Jalan, Minne, Base and Giftee, each of which are offering rewards ranging from coupons to free shipping on orders. In conjunction with the promotion, Apple added APLUS, EPOS, JACCS, Cedyna, POCKETCARD and Life to its list of participating card issuers. Most of the new firms are offering some form of reward as part of the spring campaign. Apple also announced upcoming support from UCS, though a timeline for integration has yet to be announced. Apple has in the past launched similar promotions to drum up interest and usage rates for its fledgling digital wallet product. Last July, for example, the company activated an Apple Pay campaign that offered U.S. customers discounts on certain in-app purchases. 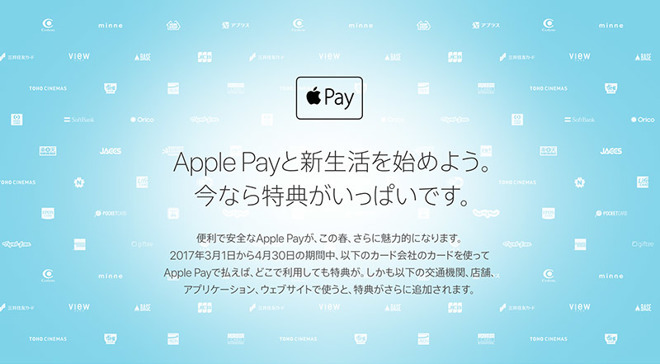 Apple Pay debuted in the Japanese market last October as part of iOS 10.1 and watchOS 3.1. While the company was anticipating a relatively high turnout thanks to Japan's mature touchless payments infrastructure, Apple Pay got off to a rocky start as problems related to JR East Suica transit cards surfaced just hours after launch. Update: Apple has subsequently added support for Yahoo Japan Card.